Is that Margaret Iisaacson second from left, front row? 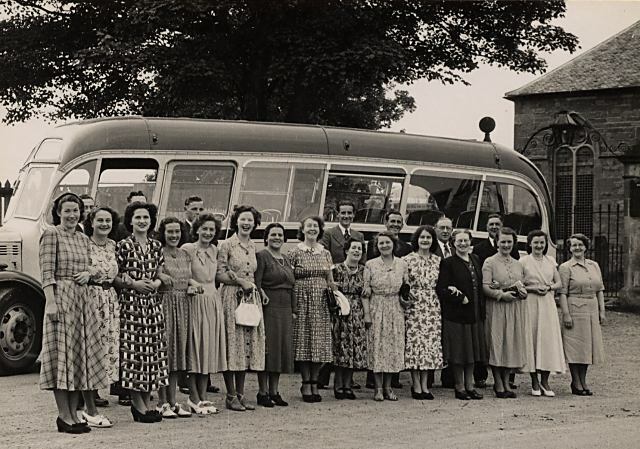 Yes I think that is Margaret Isaacson ....and that is Jean Taylor ...six from left ( front row ) don't know if she was married to Peter ..in back row then though ? It's good to see all the faces I grew up with ..not many I don't remember in this collection of Cromarty locals.....including my much beloved teacher Jessie Munro. The two between Stella Watson and martha Reid I am sure is Daisy McKay and Maggie Pringle(Ferguson) I am 99.9% sure of this. Yes thats Maggie Pringle ..John ..third from the right ..front row !! Yes Sue ..Thats my memories of Jessie Munro as well ..she certainly loved her "frills" and her singing !! What a thrill to see my granny Margaret Pringle. She looked so good and had not changed from when I knew her - a great lady.. Very pleased to see the picture of my Aunt Jessie Munro.We visited her in Cromarty several times on our visits from the USA. Gent third left at back is my uncle, William Beattie, who lived at Allerton Farm. Does anyone know!!!! Is that Jocky Ross's Bus??? He used to live out at Resolis. Does anyone remember Peddiston School, which my uncle William (Bill) Beattie once attended.